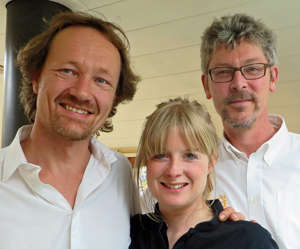 ​Captain Finnegan and Emily, owners of Saraphina, bring their extensive experience in hospitality and piloting from their many years on luxury barges to make your week cruising on Saraphina a fun and casual holiday. Saraphina is a Dutch barge built in 1924 and converted in 2007 to a warm and welcoming vessel with a mixture of traditional charm in the captain's cabin and wheelhouse to a contemporary, bright and whimsical interior delighting the artistic spirit in their guests. 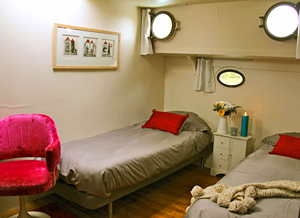 They have carefully and creatively designed the barge to ensure their guests enjoy a relaxed and comfortable stay. The open kitchen where Finnegan and Emily prepare meals makes the flavor of the barge like friends welcoming friends to their home for ​an adventurous vacation. We pick you up from your hotel, train station, or local airport and bring you safely aboard Saraphina. 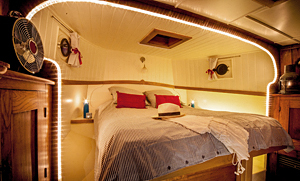 After a short cruise through the "mini Camargue" and a Champagne welcome, your first dinner will be served aboard. Our beautiful mooring in the countryside is close to the village of Portiragnes. After breakfast, you will be taken to the historic streets of renaissance Pezenas, with its arts, crafts and antique shops. After a typical bistro lunch in Béziers, we cruise over the aquaduct and up the majestic flight of locks at Fonserannes. This evenings mooring is ​​near the town of Béziers. The morning visit brings you to the cistercien abbey of Fontfroide. After lunch at a quaint restaurant with a stunning view of the "Pond of Montady", we cruise along the windiest part of the canal to our mooring in Capestang, a small village with a charming square where you can enjoy an aperitif with a view on the enormous 12th century collegian church . Our tour guide takes you to Narbonne, known for the archbishops palace, the gothic cathedral, shopping, and the famous covered foodmarket, where you will choose a selection of sea food or charcuterie to enjoy back onboard. We then cruise to another stunning mooring next to the sleepy village of Le Somail. Take the opportunity to visit the world famous antique book shop and the ateliers. 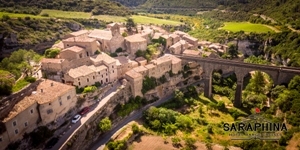 T​oday, we visit brings the medieval Cathar village of Minerve and the Oulibo olive oil factory​. ​After ​an enjoyable lunch ashore, we return to the barge for an afternoon cruise to Roubia. If desired, a wine tasting before dinner ​can be arranged. The medieval city of Carcassonne is a highlight of the week. After a guided tour around Europe’s largest medieval fortified town, and lunch, we set off for the final cruise to the village of Homps and our farewell dinner aboard. After breakfast, you will be transferred to the train station, hotel or local airport for your onward journey. 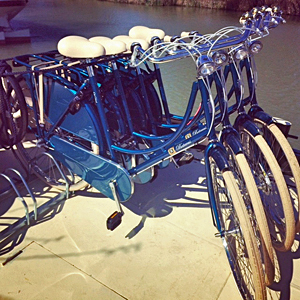 Emily and Finnegan are ready to welcome you on their whimsically decorated and invitingly creative barge.